The Gospel according to St. Matthew had long served the Christian Church as the backbone of its liturgical proclamation of the life of Jesus. Luther’s liturgical reforms in Wittenberg maintained the Sunday lectionary and also appointed Matthew as the text for weekly serial preaching on Wednesday mornings. 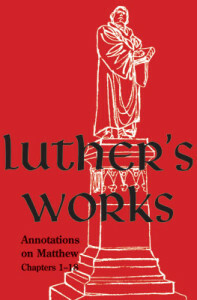 Specifically, Luther’s Works Volume 67 presents Luther’s Annotations on Matthew 1–18, which the reformer prepared for the use of Hieronymus Weller (1499–1572). A former student, Weller was assigned the preaching responsibility for Wednesday services at the Castle Church in 1533, but his insecurities concerning this task caused Luther to invest considerable time and attention in providing a “preaching guide” that addresses both the interpretation of the scriptural passages and homiletical strategies for preaching them. In annotating Matthew’s text for another doctor of theology, Luther grappled with questions of the exegesis of the Synoptic Gospels at a level of technical detail more characteristic of his university lectures than of his preaching. Because Luther never offered a series of lectures on the Gospels, the Annotations on Matthew have tremendous importance as his fullest systematic scholarly engagement with a Synoptic text. In that exegetical engagement as well as in his recommendations to Weller for preaching on the texts, Luther drew especially on the discipline of rhetoric—the use of language to persuade and move human beings—to interpret Matthew’s narrative and Jesus’ speech presented there and to identify strategies for the effective homiletical presentation of those texts to Weller’s contemporary audience. For Luther, trained as a Nominalist and later embracing humanist studies, a rhetorical understanding of Christ’s speech—and the rhetorical application of His Word in the present—is vitally important for Christians. The crucial knowledge about God is not philosophical knowledge about the divine nature in relation to the creation, which could be obtained by reason or meditation or observation. Rather, it is the knowledge of God’s “counsel and will,” which must be revealed in Christ’s Word and proclaimed through the continuing ministry preached by His disciples. This was the task Luther sought to model for his timid student in the Annotations on Matthew.